Dr Raspin drew upon themes from his new book, What’s Your Competitive Advantage? 7 strategies for running a more profitable business in a complex world. 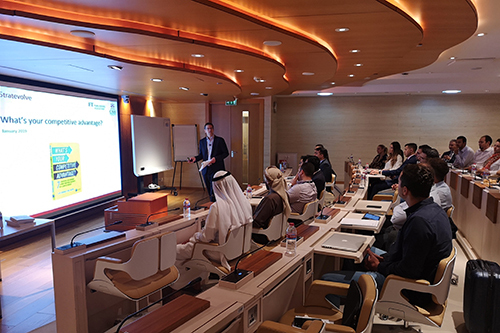 City, University of London’s Dubai Centre was delighted to welcome Honorary Visiting Fellow Dr Paul Raspin, who gave a masterclass in strategy to Executive MBA students, alumni and prospective students. The dynamic session was based on highlights from Dr Raspin’s new book, “What’s Your Competitive Advantage? : 7 strategies for running a more profitable business in a complex world”, which is geared towards top management teams, executives, anyone with a business, students and academics. Dr Raspin co-authored the book with Professor Cliff Bowman of the Cranfield School of Management at Cranfield University. Specialisation - focus on a single product and compete through superior product performance. Adaptive - build in flexibility to enable the system to respond to changing customer needs. Low cost - deliver equivalent product quality compared to competitors but with a continual focus on cost reduction. Innovation - compete through product innovation. Excellence - continuous improvement of service quality. No frills - serve price sensitive customers with a stripped down alternative product or service. A visiting senior fellow at Cass Business School since 2010, Dr Raspin is currently teaching these insights in his elective module Managing Value Creation: Linking Strategy and Finance to students on the MBA programmes at Cass. To find out more about the book, contact Dr Raspin on paul.raspin@stratevolve.com or LinkedIn.com/in/paulraspin.